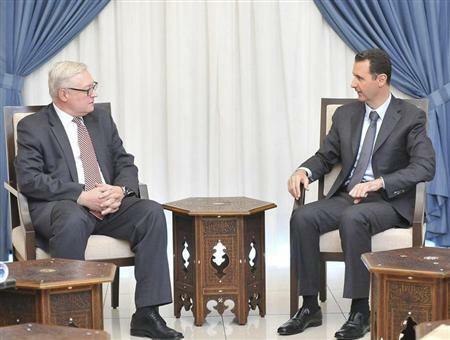 MOSCOW (Reuters) - Russia is ready to help guard Syrian chemical weapons sites and destroy President Bashar al-Assad's stockpiles but will not ship any of the chemical arms to Russia for destruction, Deputy Foreign Minister Sergei Ryabkov said on Thursday. Ryabkov was outlining some of the contributions Moscow is willing to make to implement a U.S.-Russian deal that calls for the destruction of Syria's chemical arsenal by the middle of next year. Russia and the United States are the only countries with industrial scale capacity to handle mustard, VX, sarin or cyanide-armed munitions, but the import of chemical weapons is banned under U.S. law. "There can be no doubt - we will not do this," RIA quoted him as saying. "We believe the destruction (of chemical weapons) on Syrian territory is the best option," he was quoted as saying, adding that the Chemical Weapons Convention prohibits the export of chemical weapons. U.S. Secretary of State John Kerry and Russian Foreign Minister Sergei Lavrov agreed this month to the deal, under which inspections of chemical weapons sites in Syria are to be completed by November 30 and its entire arsenal destroyed by June 30. Permanent U.N. Security Council members Russia, China, the United States, Britain and France are trying to agree a resolution that would support the deal for Syria to abandon its chemical weapons and be acceptable to both Russia and the West.